The 8 in 814ce refers to the 800 Series with its Indian rosewood back and sides and its upscale appointments. The 1 indicates it is a 6-string guitar with a softwood top, which in this case is Sitka spruce. The 4 stands for the particular body size, the Grand Auditorium. The c stands for the cutaway of the treble side. And the e stands for the on-board electronics, specifically the Expression System 2. Learn more about the ES-2 HERE. Evenness across the strings and up the neck, nicely balanced between power and sensitivity, the 814ce example I played at Mandolin Brothers provided the commanding fundamentals with the high end sparkle and sculpted low end definition, enhanced by the extra warmth and complexity that people look for in a Taylor made from rosewood. There was that exemplary Taylor sound, where strings picked across melodies or fingerstyle patterns retained their identity, with nice separation and precision, no matter how hard or soft they were played. There too were the classic Taylor chords, each fusing the notes together into one colorful entity. But there was a whole lot more going on when it came to the sonic detail and dynamics in this particular guitar. At first strum, a solid bass note sounds and holds steady as the wound midrange strings articulate, before locking together with the brighter trebles to form a chord that is suddenly mirrored in a shimmer of sprightly overtones, which peak quickly before falling out and down around a gathered core of woody midrange sustain. So far, so Taylor. It is only through a slow arpeggio, when the same chord was played out one picked string at a time, that the thicker presence from the lowest bass string and the intensity of the resonant high harmonics was notably apparent. The strength and density of the midrange notes stood up and out, nicely balanced between the warm rosewood bass and the resilient treble notes with their reflective overtones. While the low E string has the definition and projection I expect from a Taylor of this size, there is something extra radiating under it, like a dollop of dark warmth. It cushions the top note for just a moment, before dropping into the bottom of the voice, leaving the round but clean edge of the primary bass note humming out there in the room. It establishes the authority of that lowest note, then reigns itself back toward the other registers, like an actor stepping out to deliver a brief but poignant line and then stepping back, still in the light but not upstaging the rest of the chorus. The fundamentals off the other wound strings sound with a forthright note, dense but defined, and ringing straight and true. And like the low E, they produce reflective warmth that adds its own character, yet it evaporates quickly and smoothly, allowing the fundamental to stand out even more clearly, and excavating an open space behind them. This is not a midrange scoop, as the top notes off the strings are quite strong. It is a different kind of openness than I have heard in other Taylors. And yet, there are subtle apparitions of resonant tone inhabiting that midrange cavern. Inside that space is detected a certain presence that never rises up into the top notes like that bassy cushion or the high harmonics. This is not the same sort of “presence” thickening the voices of traditional dovetail guitars made up the coast at Santa Cruz or over in Pennsylvania at Martin. It is fainter and ethereal, translucent and three-dimensional. And it materializes there in that open space like a fleeting mirage I find most alluring and very attractive. This phenomenon is wholly different from the bold harmonic overtones tied directly to the strings in the typical Taylor way. It is something down inside the voice, coming from the tonewood body. And most interesting of all, I do not hear this radiance or glow, or whatever it is, when I am out in front of the guitar. Or rather, I do not hear it as a separate and identifiable component of the voice. It goes unnoticed but contributes sound none the less, the way a chef might secretly add butter or eggs where one does not expect them, subtly increasing the richness of a signature dish and their own reputation in the process. And the reputation of Taylor’s 814ce has certainly grown in my eyes and ears. And that is due in part to that extra richness, which is detected in the mids but influences the entire tonal palate from the lowest note of an open tuning to the brightest 10th fret chord. The Grand Auditorium first appeared in 1994, as Taylor Guitars marked its twentieth anniversary with the debut of this versatile design. Combining dynamic elements of their dreadnought size with their smaller grand concert size, Bob Taylor sought to realize a “Swiss army knife” sort of instrument that could succeed across many styles of playing. With wide dynamic possibilities due to a good-sized sound chamber, 4-5/8″ deep, backing a 16″ wide top large enough to take serious strumming, yet braced to breathe easily under the influence of gentle fingerpicking, the innovative new shape quickly grew in popularity due to its powerful midrange, pronounced trebles, and a deep, rounded bottom end that maintained a nicely defined edge. The Grand Auditorium size now accounts for 60% of all Taylor guitars sold throughout the world. Available at all levels of the Taylor catalog, in many varieties of tonewood and trim, the rosewood 814ce has proven to be the most popular, with one exception – the newly redesigned 814ce. In January of 2014 the 800 Series received a makeover befitting its position at the vanguard of Taylor’s upper echelons. The dark, rich grain of the Indian rosewood is set off beautifully with maple binding the hue of creamery butter. The Sitka spruce used for the soundboard is of obvious high quality. It sports a subtle toner that appears suntanned next to the lighter maple and is tastefully trimmed with rosewood purfling, consisting of the thinnest line inlaid along the binding and a stripe three times as wide set further into the top. Both the maple binding and rosewood purfling were chosen for their consistency of color and lack of flamboyant grain or quilting. This smartly allows the fine cross-grain of the quartersawn spruce and the bold banding of the rosewood back and sides to stand out all the more. The practical array of strings, frets, and sound hole are dressed in a regal tableau of silver and black. The bridge and headstock are made from gleaming jet black ebony, with glints of light reflecting from the mother of pearl Taylor logo at one end and the abalone pearl dots on the ebony bridge pins at the other. Between them there stretches the long-scale ebony fingerboard, bound in maple and showing off natural color variations that Taylor describes as “marbled.” This dark and stormy wood is segmented by nickel frets and inlaid with seven mother of pearl fret markers in the Element design, which like the logo, shine with the luster of sliver and argent white. But when the light hits just right, pastel colors suddenly flit on and off like sprites. The rosette is made of abalone with a kaleidoscope of large facets. It too is primarily silvery in hue, with shadows of the palest green contrasted with rosy accents. It is trimmed by thin lines of rosewood that tie in with the purfling around the edge of the top, and the impressive rosewood pickguard with its slanted field of grain. The maple used for the binding, back strip and heel cap appears almost white from the back, because of the dark browns of the rosewood, the pale peachy stain used on the mahogany neck, and the large silver tuning machines. I absolutely love these tuners. The buttons are comfortable, and they turn as smooth as silk, never varying in tension, or actually in their lack of noticeable tension, and they zero right in where I set them and stay there. As it happened, this particular 814ce had just been restrung that morning, so the strings were stretching out of tune even during the short pieces I was recording. I didn’t realize how noticeable that would be in the finished video. So, I want to make it clear this had nothing to do with the tuning machines, which are top notch in every respect. As for that mahogany neck, it is fast and comfortable. The 1-3/4″ width at the Tusq nut allows a little extra room where the wrist must bend at its most acute angles, but the string spacing at the micarta saddle is relatively narrow and the svelte shaping of the neck farther up the frets sees to it that everything remains easy on the hands, and a lot of fun to play. 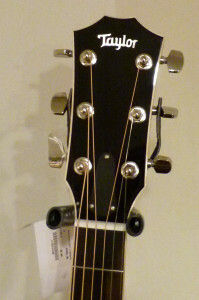 Taylor Guitars ascended into public notice during the era of “full thickness” necks, as the first company to successfully put what was for all practical purposes an electric guitar neck on an acoustic guitar. While their original bolt-on mortise and tenon neck joint provided the easy adjustability of an electric guitar, it was the sleek profile that immediately won over a generation of guitarists who grew up playing Teles and Mustangs. For a while the Taylor necks became more and more shallow. But in recent years they rethought the whole thing. As the rest of the industry reduced the girth and shape of their necks to fill a public demand inspired by Taylor, Taylor reshaped their own necks to add more mass. While they are still sleeker and faster than many other necks out there, they feel more like acoustic guitar necks to my hand. And I like that, because I am an acoustic guitarist, not an electric guitarist who sometimes plays an acoustic instrument. I particularly like how they shape the area where the neck, binding and fingerboard come together. It is smoothly beveled, or tilted in toward the fingerboard, similar to what Gibson calls a “rolled” edge. It provides an area for the thumb to rest upon without any genuine edge or angle that can turn into a pressure point. 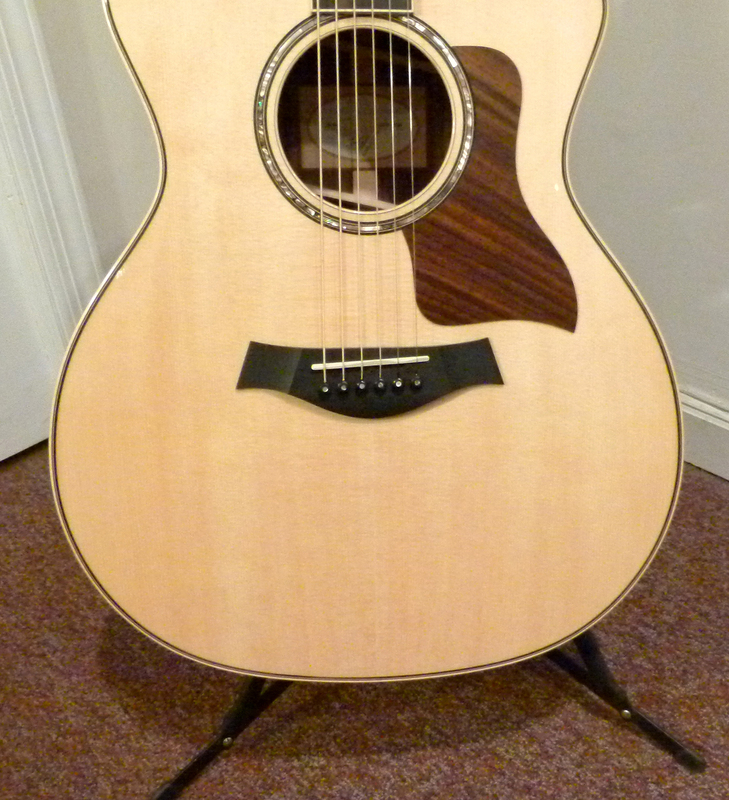 But best of all, it accommodates traditional “American style” thumb-fretting very nicely indeed. 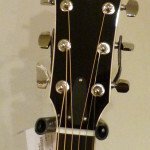 The profile itself is gently rounded and has a bit of a ridge along the apex, but not sharp or pronounced enough to be a V, so it easily accommodates someone playing with formal, thumb-glued-to-the-back-of-the-neck sort of technique. In some respects it reminded me of a typical acoustic Gibson neck, yet in others a Collings neck without nearly as much V. The highest compliment I can pay to this neck is the fact that I noticed how it felt for about one minute and then I never gave it another thought, because I stopped noticing it at all. Taylor also revamped their neck joint some years ago, to prefect its adjustability, based on their practical experience and feedback from guitar tech gurus. This was not likely something that had any effect on the Taylor sound, with those focused fundamentals and sparkling clear trebles. But Taylor has since implemented other changes that most definitely have an impact on tone. Master Luthier Andy Powers didn’t just refresh the cosmetics on the 800s. He was given carte blanche to recreate the entire line, inside and out. And this he has done in impressive ways. The 800s constitute Taylor’s largest dollar generating series, by no means cheap and yet still wisely priced within reach of most anyone who is ready to step up to a professional-level guitar made from select woods with premium trim. Since the Grand Auditorium entered the regular catalog line up in 1996, it has taken over as Taylor’s most popular guitar size. And the 814ce is the most popular of all. But when the Grand Auditorium 814ec appeared in 2014 with Powers’ innovations, it outsold all other guitar models in the entire industry, acoustic or electric, in terms of dollars spent. Some of the innovative changes he brought to the 800 Series include a thinner high gloss finish, varying tonewood thickness depending on the size, and a new approach to bracing, wherein each size has its own specific bracing pattern, all based around a narrower parabolic X brace designed to be stiff in the center while allowing “loser” movement out near the edges, where Taylor puts their patented Relief Rout. For decades I have argued that a guitar soundboard acts as a diaphragm similar to the head of a drum, and how routing a trench around the edge to inlay decorative purfling was coincidentally thinning out the top near where it is attached to the sides, increasing the flexibility of that diaphragm. Well, the folks at Taylor struck upon an ingenious way to put this same principal into practice when they invented their Relief Route some dozen years ago. They carve out an even larger trench, maybe twice the width of typical purfling with a depth of about 1/3 the total thickness of the soundboard. Only you won’t see it, because it is on the inside of the guitar. And they put this trench farther in from the edge, so the spruce is thinnest before it comes into contact with the kerfing that stabilizes the top to side connection. The result is a guitar top that moves more easily and responds better to subtle changes in vibration and damping, thanks to that wide swath routed out of the spruce. And on the modern 800 Series they have matched this innovation with the new Advanced Performance bracing, which includes narrow, slanted back braces on this particular body size, along with a new take on side bracing that provides greater rigidity to support the more flexible back and top, and tone bars carved to help the parabolic X brace disseminate resonant energy across the wide soundboard. It would be impossible to isolate just what this new bracing does to the voice of the 814ce, given the other changes that have arrived with it. For example, the thickness of the top, sides and back are now unique to each body size within the 800 Series. I do not know if the 814ce changed in this respect compared to the previous version or other rosewood Grand Auditoriums. There is also the thin finish. Taylor uses a UV-cured high gloss polyester finish that is very hard, and it is responsible in part for the clarity and brightness of the signature Taylor sound. But it is also somewhat constrictive when it comes to tonewood being able to breathe and flex when under bombardment by resonant sound waves. Andy Powers challenged Taylor’s technology experts to come up with a way to apply the same finish at half the thickness. And they got almost all the way there. Where the traditional Taylor finish averages some 6 microns thick, their new thin finish averages barely 3.5 microns, allowing the rosewood and spruce to move more easily when vibrating. And then there is the glue. The 814ce has fish protein glue to construct the body and attach the bracing, while traditional hide glue is used to join the hard ebony bridge to the softer spruce top. While some claim they can hear no difference when animal glue is used to make guitars, I am among those who feel whatever it brings into the construction process results in a noticeable difference in tone. Whether the difference is determined to be an improvement remains a matter of personal taste. And the same can be said about the overall difference in tone and dynamics experienced in the new 800 Series guitars when compared to their predecessors. This 814ce showed off many of the famous Taylor hallmarks. It has those solid fundamentals that keep their identity and definition no matter how hard one plays, yet still unify when creating chords. And it has the Grand Auditorium personality, articulate when picked and punchy when strummed, with a rounded bass note topped by an evenness across the strings that runs all the way up the neck. 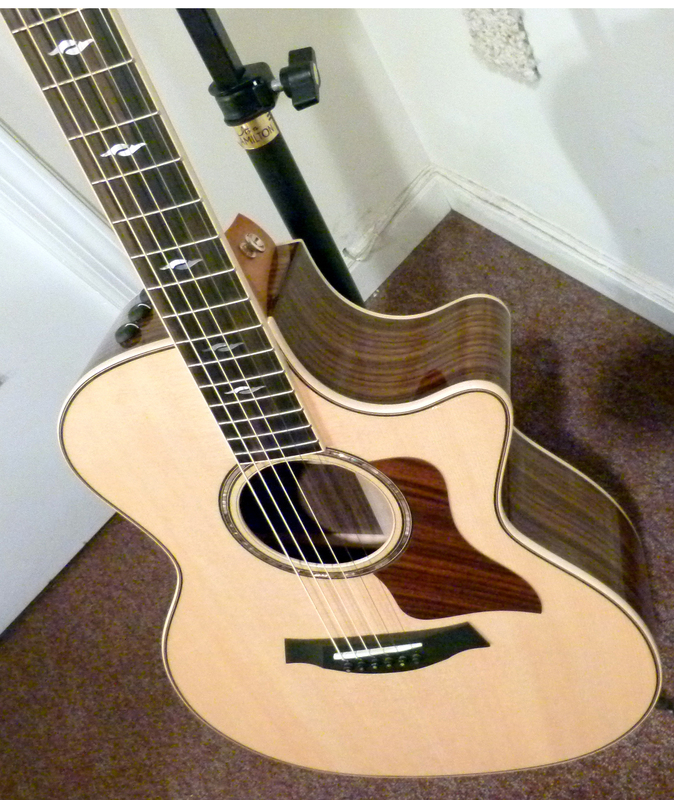 But the revamped 814ce also offers some tweaks to that signature sound. The bass is a bit thicker and warmer. The midrange is pronounced with clear but denser notes, and with that ethereal resonance thing hovering behind them. The trebles have prodigious reflective resonance, even more than they used to do. So the top notes don’t stand up and out with the same kind of laser definition. They come off sounding wider and hug closer to the rest of the voice, because there is so much in the way of overtone reflecting out around them. And what I like best about it is how it still has the Taylor clarity when flatpicking melody or solos, where any sonic bells and whistles fall back as the main notes take center stage. Only now? They are even denser and stronger notes, with considerable power and purpose. This model didn’t get a makeover, it got seriously buff. It is not like all of these sonic features are wholly new. It is just a subtly different recipe, an increase of this or that, or a little less of something else. And by no means do the new 800 Series Taylors and the upcoming refresh of the 900 Series make obsolete those that came before them. I am sure there are plenty of Taylor players who will love no less their tried and true 814ec built B.R., before refresh. In fact, they might prefer it to the sound and dynamics of the new one. Personally, I enjoy that extra ethereal resonance swelling out from picked notes, and the way sweeping chords leap forth, but have a micro-delay before a swell of sympathetic tone catches up to them, only to waft back just as suddenly, making all the more noticeable the definition and solidity of those top notes ringing off the strings. And I am sure I will not be alone in that assessment. I just discovered this lonely three year old review because, as a lifelong Martin aficionado, I just discovered Taylor. It is very interesting to me to read your depth of analysis of Andy Powers early work at Taylor while knowing what has transpired three years hence. In particular, your insightful comments about AP’s tweaks to Taylor’s X-bracing in 2015 clearly foreshadow his revolutionary “V-Class” concept currently taking the market by storm. 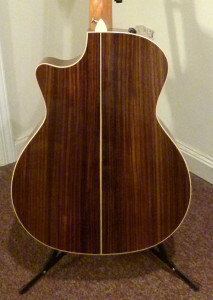 I’ve jumped on the bandwagon with an order for the brilliant all-Koa K24ce V-Class. I for one vote for more Spoon Reviews of Taylor, and I would like to humbly request you begin with my luscious Koa model. I can only review guitars that people will allow me to video and record with mics. That means people let me video their privately owned instruments, or someone who sells them has to let me set up my gear and make the videos. I was expecting to start doing this here in NYC, when my friend Stan Jay passed away, and then his family ended up closing Mandolin Brothers. That is where this lone Taylor review came from. I have tried to negotiate with other NYC guitar dealers to let me come in and shoot such videos, but someone farther up the company ladder has always shot down the proposition, thus far. I may try again this autumn. And congratulations on your upcoming guitar, I am sure you will enjoy it a great deal. This is brilliant review, exquisitely written and accurate to a T. And it isn’t faint praise. It is a full-throated endorsement of the ingenious changes Andy Powers made to the 800 Series (and now the 600 Series). And that’s saying something coming from an aficionado, like yourself, whose primary instrument is a Martin. 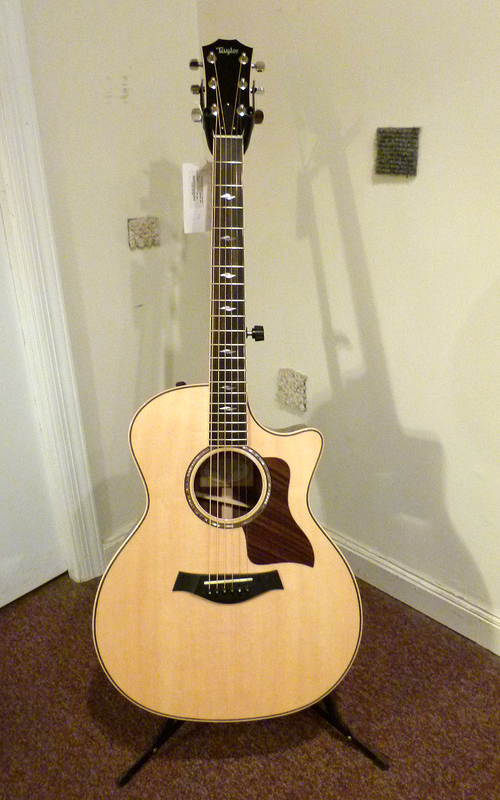 I bought my first Taylor this year. A 414e that I found to offer the right balance between versatility and affordability/value. Despite playing Martins primarily most of my life (now a 000-18, D-18, and OM-21), my experience with the 414e parallels your description of the 814ce. You mention that the 900 Series is the next to revamped. While it would be welcome news to see Andy’s design changes applied to any Taylor line, I was really hoping the 500 Series would be next which I think could benefit from an infusion of the woody mid-range sweetness that historically is the earmark of mahogany guitars. Or maybe it’s just my affinity for the voice of an 18.